It happens on occasion to everyone. That detailed email you created to introduce your brilliant proposal is perfectly worded, and just as you click the send button, you remember - you forgot to attach the actual proposal. Now, you have to draft a follow-up email saying how you goofed and the file is now attached. 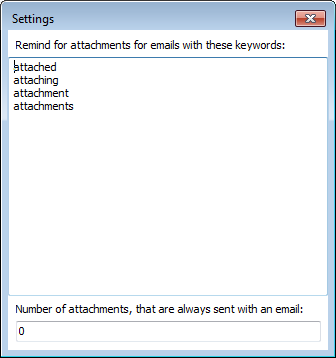 Before there's a next time, download our simple reminder add-in for Microsoft Outlook. 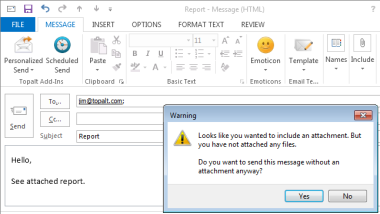 If your email indicates an attachment is part of the message, a reminder will pop up automatically if you attempt to send without adding a file. Alleviate any future questions concerning your competency. Life can run at a fast pace at times, and the little details sometimes get lost in the mix. This easy, fast to install the app will save you countless follow-up emails, apologizing for your oversight. Click Order Now to get the full version for only $19.95. Volume discounts and multiple currencies available, click Order Now for more information. 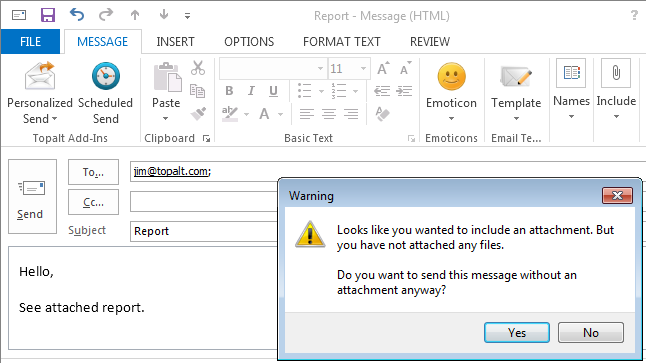 This Add-In Is Part Of Topalt Outlook Add-Ins Bundle. Get 12 Add-Ins Bundle Here!